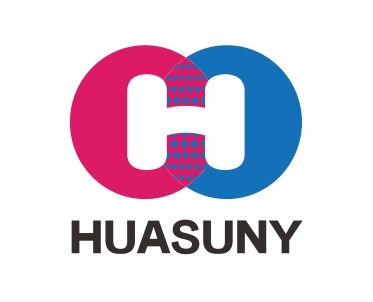 Huasun new glass video wall product "TRANS-EYES" transparent LED display: Indoor installation, outdoor use, had no effect on the architectural appearance. 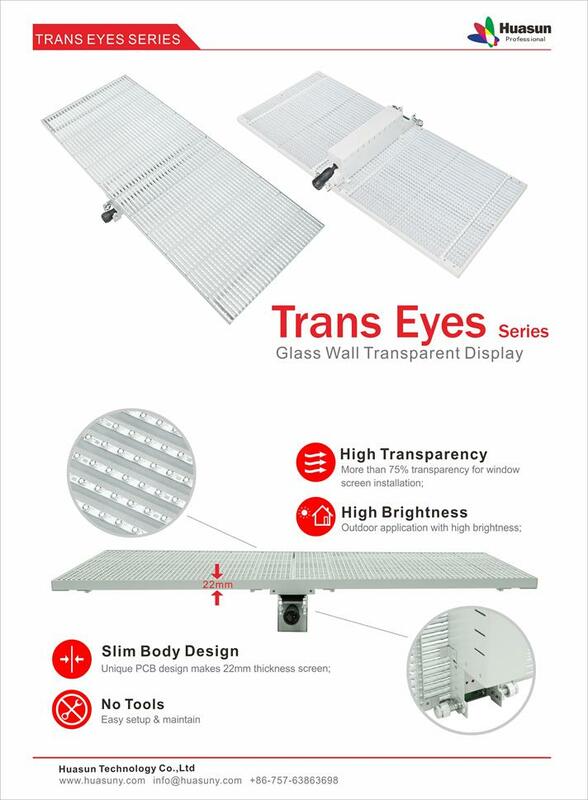 Can be used in places where have glass curtain wall such as bank, shopping mall, theater, Commercial Street, Chain Store, hotel, Municipal & public buildings, landmark building and so on. Such Led glass video wall adds a high-tech element to these places and hold more attention. More that 70% transparency, better transmittance. 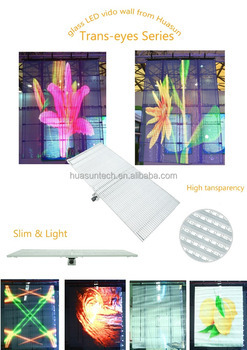 It may satisfy higher requirement of day-lighting, light transmission. Nearly imperceptible the LED display from a distance. Standard size can be used to assemble larger displays. All power supplies and receiving cards are build into the modules, and power cables can easily be connected. Brightness can up to 4000nits, applicable to direct sunshine environment. 1.Warranty: 1 Years. Lifetime free maintenance and upgrade. 3. Complaint respond period not exceed 24 hours; maintenance guidance and problem solution supplied in 48 hours.